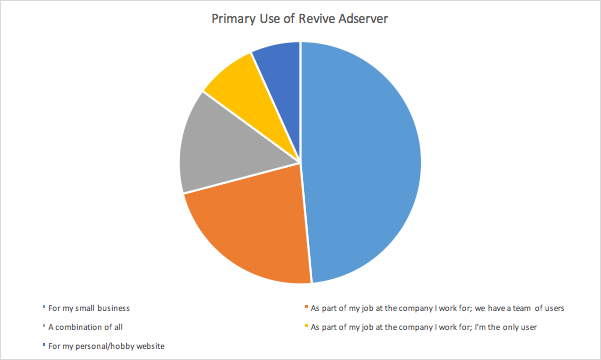 In May 2016, we asked the Revive Adserver community to take part in our first ever survey, to find out more about what the community thinks about the Revive Adserver project. Thank you all so much for taking part – we were delighted to receive just over 140 responses to the survey. 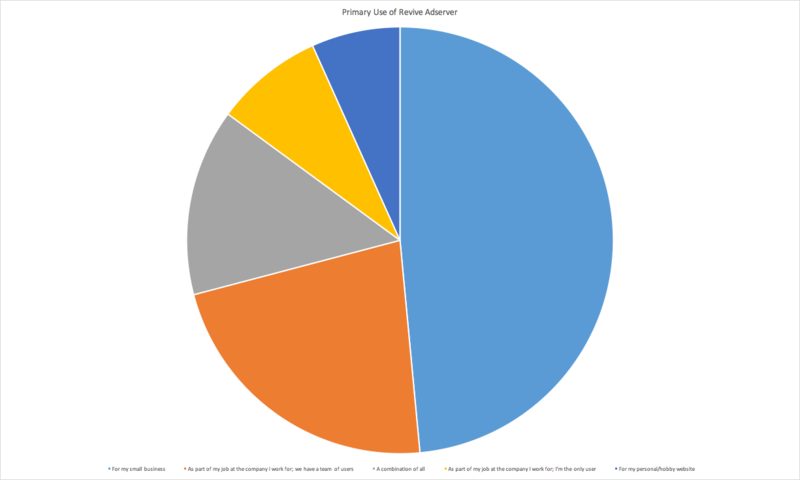 Somewhat unsurprisingly, our most active and engaged members of the community were the primary respondents – over 80% of responses came from users who were (at the time of the survey) using an up to date version of Revive Adserver. Over the last few days, we have been taking a look at the results of the survey and wanted to share the following information with you all. We were delighted to see a good mix of engagement from both newer arrivals to Revive Adserver, as well as old hands who have been using the software for many years. While most Revive Adserver is mostly used by small business users, the next biggest segment is users at larger companies where there’s a team of users. 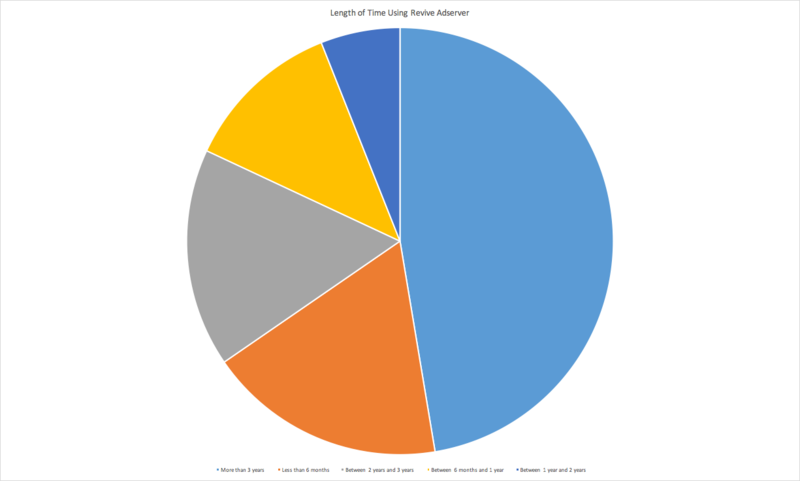 It was also interesting to see that the 3rd biggest segment of Revive Adserver users are using the software in a number of different situations, suggesting multiple installations for different uses. 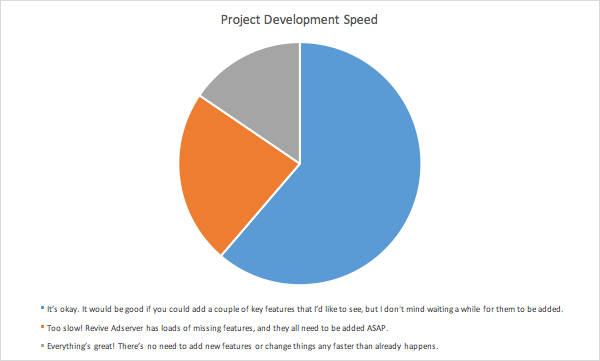 It’s hardly a surprise to learn that on the whole, the community thinks that it would good to have some key missing features added to the product. The clear and obvious winner for a key missing feature is native HTML5 banner support in Revive Adserver, with over 65% of respondents listing this feature in their “top three” missing key features. The next most requested missing feature was cookie-free banner delivery, with just under 50% of respondents listing this feature in their “top three”. It was also pleasing for the Revive Adserver team to see that the most popular “other” suggestion put forward by the community was native MySQL support in PHP 7, which the team has added with the release of Revive Adserver 4.0.0. 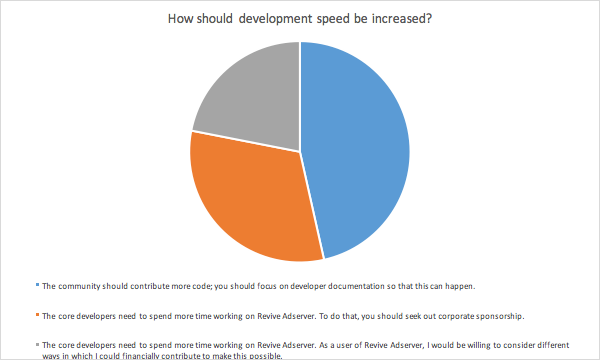 When respondents indicated that development on Revive Adserver could be faster, they were asked how they thought that could be achieved. 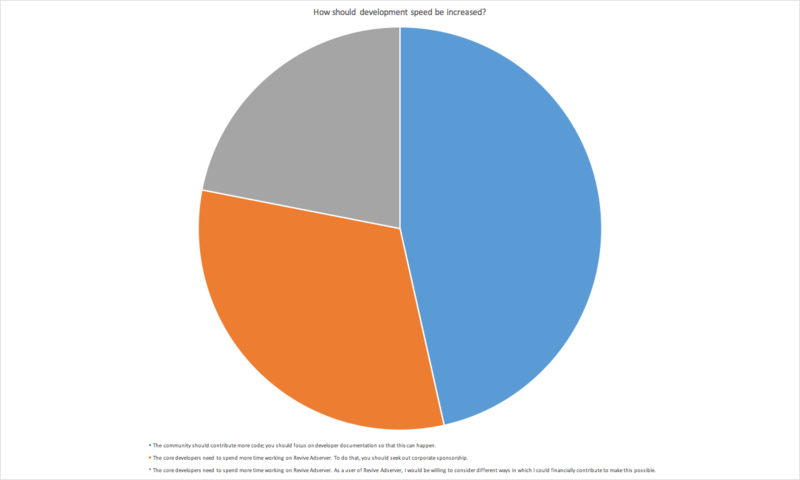 Of these respondents, 46% indicated that the best way for development to be faster was for developer documentation to exist so that the community could make changes, and 32% indicated that corporate sponsorship should be found to let the team do more development. Only 22% of users indicated they would be willing to actually participate in funding the development of the open source project. 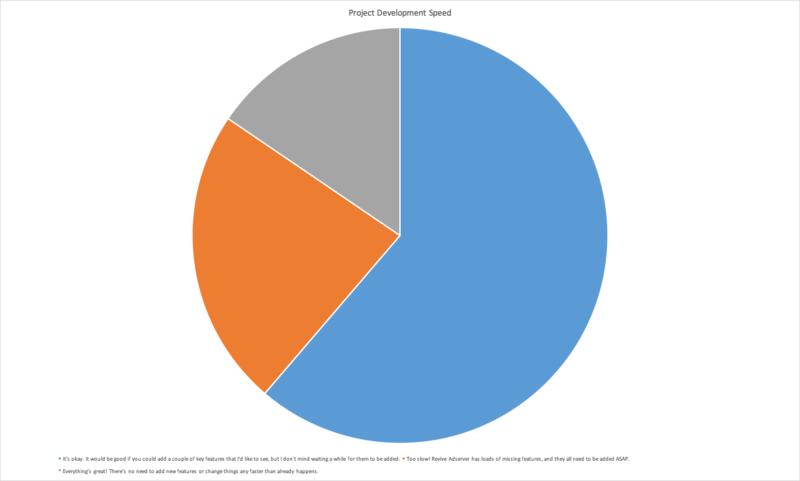 How should development speed be increased? There was an almost equal split between the top four options selected for how any possible funding should be obtained – one-off crowdfunding for a fixed set of features, monthly contributions, one-off crowd funding on a feature-by-feature basis, and purchasing commercial plugins. We hope that the above information is of interest to you all, as members of the Revive Adserver community. 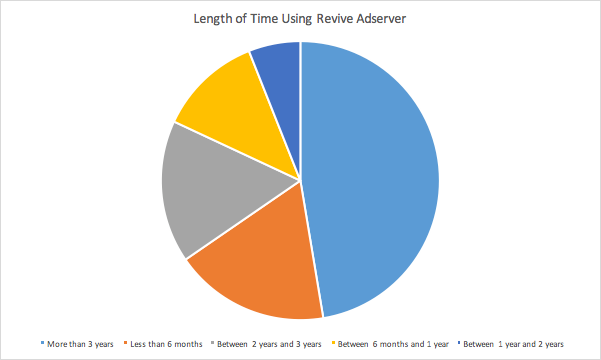 We’re proud of what we’ve achieved in the last 3 years of Revive Adserver’s existence, and in the coming weeks, we will be discussing the survey results in more detail within the core team, to decide on our plans for the next 3 years and beyond!